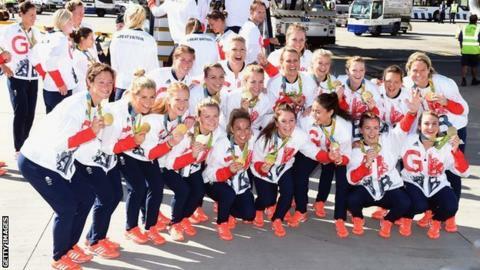 Women are on course to outnumber men in the Great Britain Olympics team for the first time, says chef de mission Mark England. At London 2012 just over 48% of the British team was female and that figure dropped to 44% for Rio in 2016, but could rise above 50% at Tokyo 2020. "For the first time it looks like we might have more women than men in the Great Britain team for Tokyo as we see the fruition of some fabulous athletic talent," said England, who hoped the team could match their Rio medal tally. "We have seen some fantastic role models in multiple Olympic champions like Heather Stanning and Helen Glover, Jade Jones and Nicola Adams. "Everybody also looks up to Jessica Ennis-Hill and they have clearly all had a great impact in terms of inspiring a new class of young female athletes which is now emerging." The International Olympic Committee is striving for 50% representation by women at the Olympic Games and the British Olympic Association's attempt to get there first may be reliant on the participation of a GB women's football team. Football's world governing body Fifa said in October it had received agreement from all four home unions to field a unified women's team at the 2020 Olympics. England's performance at the Women's World Cup in France this summer will determine if Team GB earn one of the four European qualification spots for Tokyo. Great Britain came second in the medal table at Rio, with 67 medals in total, consisting of 27 golds, 23 silvers and 17 bronze medals. "We have tough shoes to fill from Rio," added England. "Typically, we don't set medal targets but we are hugely confident that the investment by UK Sport and the work that has been undertaken by the home countries' sports institutes and, in particular, by national governing bodies will make Team GB as successful as it was in Rio." The Tokyo Games begin in 500 days' time, running from 24 July to 9 August 2020.